Omar Hassan and Hezron Awiti fight infront of their leader Kalonzo Musyoka in Mombasa. - Bana Kenya News, Real African Network Tubanane. Home featured Omar Hassan and Hezron Awiti fight infront of their leader Kalonzo Musyoka in Mombasa. Omar Hassan and Hezron Awiti fight infront of their leader Kalonzo Musyoka in Mombasa. The wiper party has now become a source of fight in Mombasa following interest in both Mombasa wiper leaders taking the lead. Today, the Nyali MP Hezron Awiti famously known as "Bolo" fist fought with the Mombasa senator Omar Hassan Sarai in front of their leader Kalonzo Musyoka. Both leaders are now looking forward to unseating the Mombasa governor Hassan Joho in the coming elections. The two leaders were told last week by their leader to seat and reach an agreement that will allow them to do the necessary as leaders and elders. The senator and the MP both of them wanted to unseat Governor Joho using the same ticket. 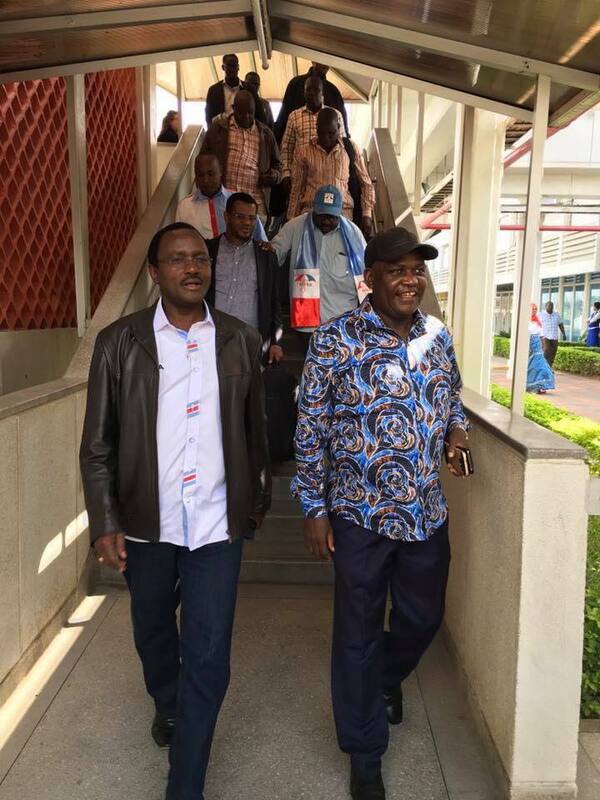 Kalonzo who has been at the coast for a very long time had a series of meetings with the wiper leaders at the Coast. Mombasa Senator Hassan Omar and his rival and Nyali MP Hezron Awiti reportedly engaged in a nasty altercation in front the NASA co-leader. Omar and Awiti then resorted to blows and kicks as Kalonzo watched in shock. It is not yet clear why the two leaders fought. Hon Kalonzo Musyoka is expected to end the fight and reach an agreement of who will go for the senate seat and for the gubernatorial position responsible. The Mombasa county has been a county of contention because the NASA the leaders are all fighting for the seat. Governor Joho is ODM deputy party leader, Senator Omar Hassan is Wiper secretary general and MP Hezron Awiti is a wiper treasurer.